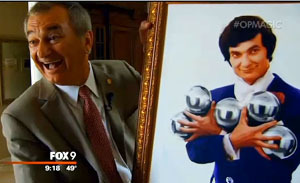 Peter Glovicki, M.D., talks magic with Fox9 News. Had it not been for magic, the life of Peter Gloviczki, M.D., might have turned out quite differently. He likely would have never magically left his native Hungary, making it a little less likely that he would become a vascular surgeon at Mayo Clinic. And that would have put the kibosh on a special magic show he performed last month for the Sisters of Saint Francis at Assisi Heights. The story of Dr. Gloviczki's talents as a surgeon and a magician traces back about 50 years, as Minnesota's Fox 9 News recently reported. Born in Budapest, the same city that gave us another pretty decent magician (hint: his name ends with Houdini), Dr. Gloviczki says he acquired his love of magic from his mother. She also gave him some advice he's kept with him over the years, regardless of the stage. "She said, 'It doesn't matter what you do, just smile,'" he tells Fox 9. At that point, Dr. Gloviczki returned to Hungary and enrolled in medical school to pursue what he calls his "true passion." But he ran into a small hitch when he decided he wanted to "advance his training elsewhere." Hungary's government wouldn't allow a physician to leave the country to practice medicine. They would, however, as Dr. Gloviczki would learn, let him leave the country to compete in magic competitions. So he used the loophole to "travel the globe" as a magician, and used his time offstage to study medicine. In 1981, Dr. Gloviczki landed a scholarship to Mayo Medical School. And he's been here ever since, which has been good news for patients like Victoria Segler, who recently came to Mayo Clinic for a procedure "so complicated" that others told her they wouldn't even try it. But Dr. Gloviczki performed "the best magic trick I could ever hope for," Segler told Fox 9. He also continues to perform non-surgical magic tricks to help put "anxious patients" at ease before surgery. And then there's his "signature" magician-themed card outside the operating room so colleagues "can always tell" which room he's operating in. When he brought his talents to entertain the Sisters of Saint Francis at Mayo Auditorium at Assisi Heights last month, there were smiles all around when he told the Sisters at one point that, "It's not magic. It's a miracle." We're told for many patients and colleagues who have come to know Dr. Gloviczki, his work over the years has been just that. Watch the report before it disappears. Then dazzle us by sharing your comments.